Martha Stewart is easily one of my food idols. She's been to prison and back, and yet she still maintains a level of class and sophistication that is so clear in all of her cooking and crafting. Her book Martha Stewart's Cookies is by far one of my favorites. It's a great go-to book for all of my cookie-baking needs. These giant sugar cookies remind me of the ones you find at bakeries. They are packed full of flavor, super chewy, and HUGE! Make sure you leave a lot of space between the cookies as you bake them, or else you'll end up with one giant cookie instead of several. Preheat oven to 350 degrees F. Sift together flour, baking soda, and salt. Put sugars and zest in the bowl of an electric mixer fitted with the paddle attachment. Mix on medium speed for 30 seconds. Add butter; mix until pale and fluffy, about 1 minute. Mix in eggs one at a time, and then the lemon juice. Reduce speed to low; gradually mix in flour mixture. Using a 2-inch ice cream scoop, drop dough onto parchment paper-lined baking sheets, spacing 3 inches apart. 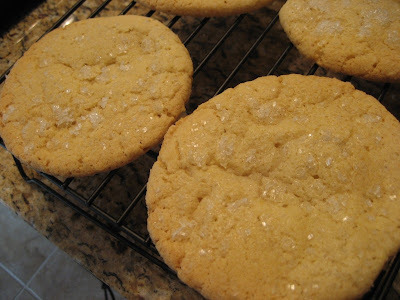 Flatten cookies slightly; sprinkle with coarse sugar or sanding sugar. Lightly brush with a wet pastry brush; sprinkle with more sugar. Bake cookies until golden, about 15 minutes, rotating sheets halfway through. Transfer cookies to wire racks using a spatula; let col completely. Cookies can be stored in airtight containers at room temperature up to 3 days.